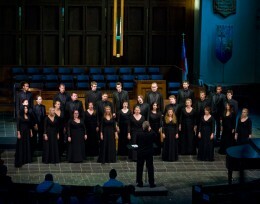 The Wright State University Collegiate Chorale earned two silver medals at the 2012 World Choir Games in Cincinnati. The Chorale competed at the Champions level with choirs from around the globe. Often called the “Olympics of choral music,” the World Choir Games is the largest choral competition in the world. This year’s event featured more than 360 choirs from 48 countries competing in 23 musical categories. “I’d like to mention how very proud I am of each of the members of the Collegiate Chorale,” said Hank Dahlman, Wright State director of choral studies and conductor of the Chorale. The 2012 World Choir Games were held at several venues throughout downtown Cincinnati including the Christ Church Cathedral. The Collegiate Chorale was honored to be chosen for the Champions level of the Games, competing in two categories—Chamber Choirs and Musica Contemporanea—and placing silver in both. Dahlman said the Wright State group was in good company; it was separated by fewer than three points from the choir scoring just above them, the University of Newcastle Chamber Choir, in both competitions. 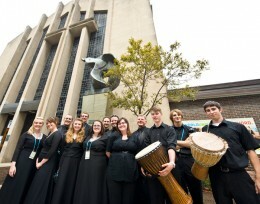 Newcastle, one of Australia’s nationally known choirs, won both categories in the 2010 World Choir Games and was ranked as the eighth-best in the world prior to the 2012 Games.